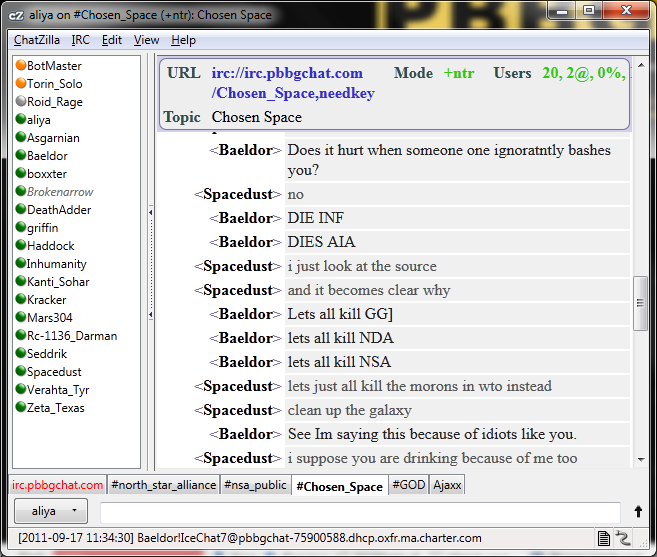 Taken shortly after BBA/CMF logs were found posted publicly on pastebin. I did not want to post this, but best to maintain a fair record of everything, lol. Unfortunately (or fortunately?) I wasn't around for Hybris' kamikaze act the night before. 5 CMF kills in less than 10 minutes by Siger. I am Rubik of Borg, and the cube was MY IDEA! 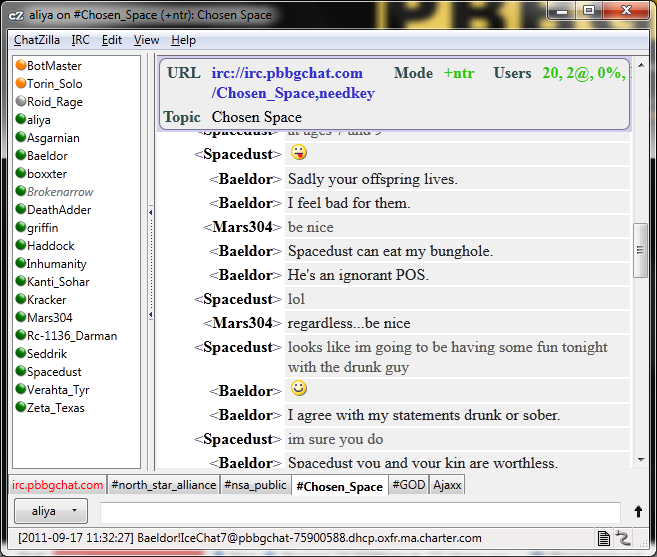 CS chat - not newbie friendly. 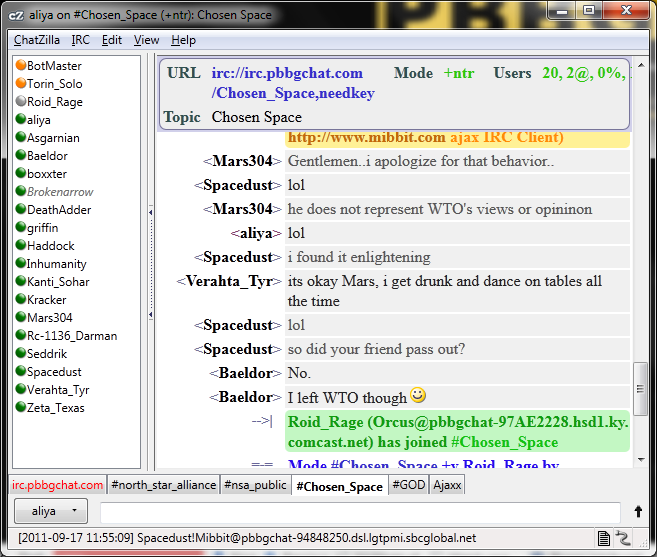 WTO member, Baeldor, is drunk in CS comms and leaves WTO. Enjoy. 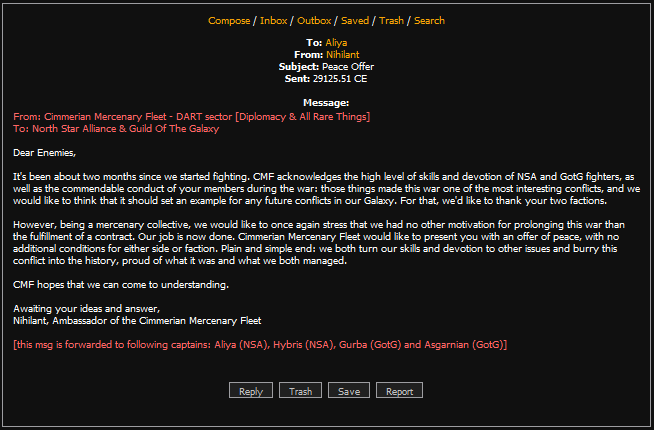 Our latest newbie, trying to get into faction comms, now I'll have to reset the key, lol. [2011-10-01 20:35:14] <aliya> how does it seem logical? 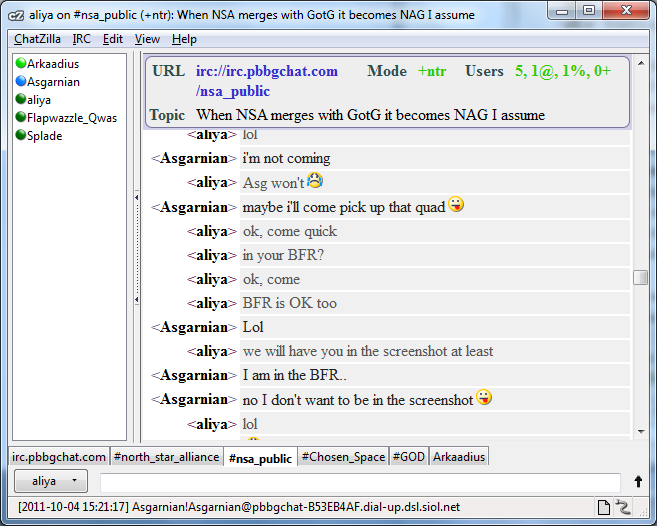 [2011-10-01 20:38:51] <aliya> we are like family? 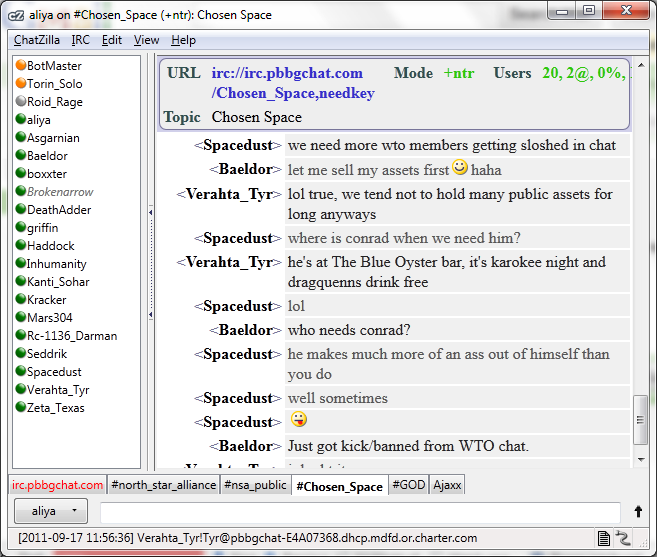 [2011-10-01 20:39:09] <Flapwazzle_Qwas> Yes we are! 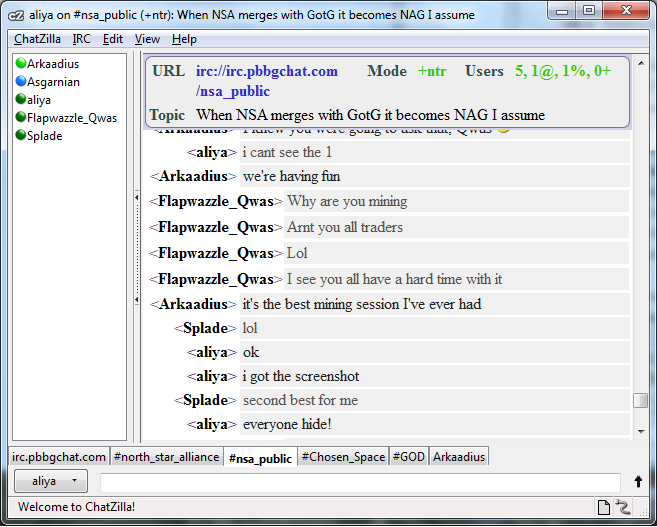 [2011-10-01 20:42:01] <Flapwazzle_Qwas> And then we could become a mega faction! 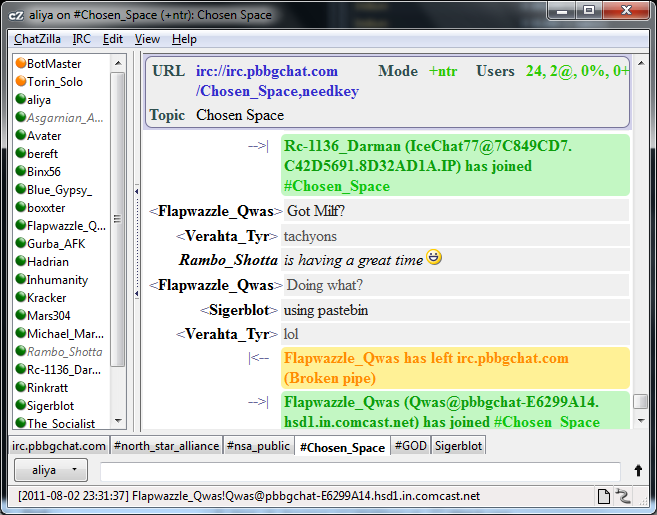 [2011-10-01 20:42:56] <Flapwazzle_Qwas> Only but a few turns! 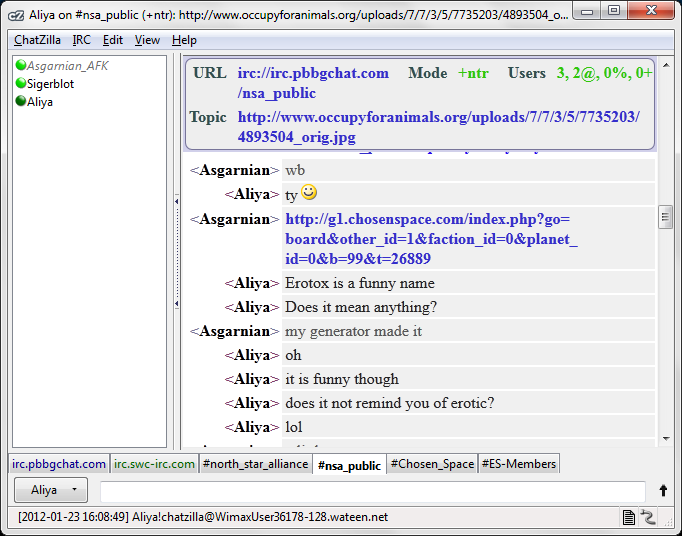 [2011-10-01 20:47:02] <aliya> are you serious? 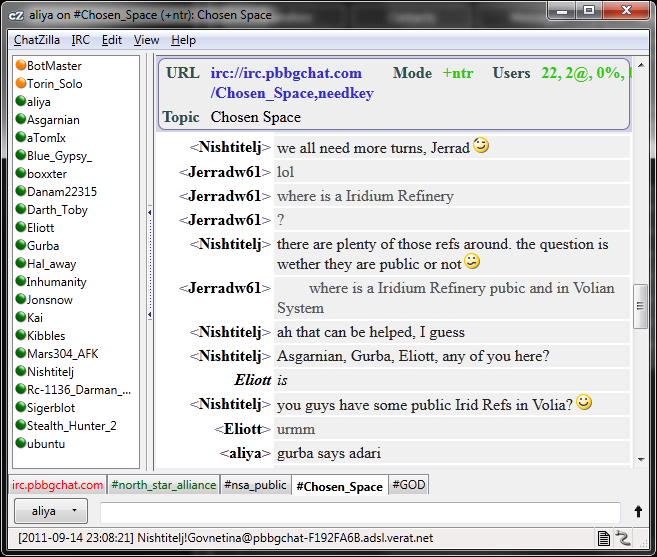 [2011-10-01 20:47:13] <aliya> you guys will consider relocating? [2011-10-01 20:47:46] <Flapwazzle_Qwas> We move and you guys take the name? 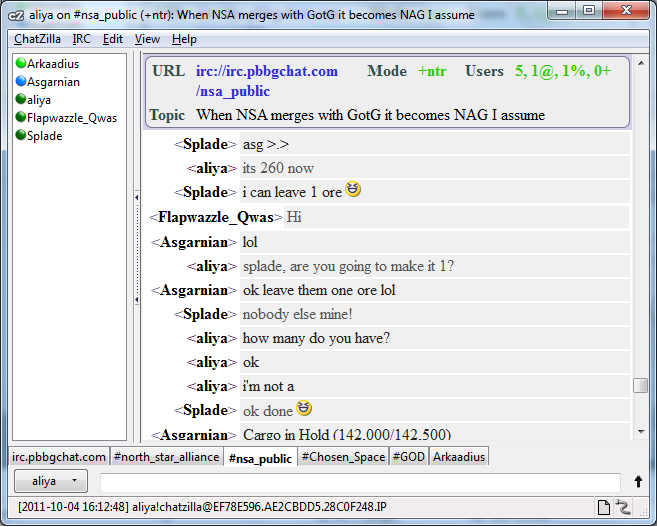 [2011-10-01 20:47:55] <aliya> take the name GG? 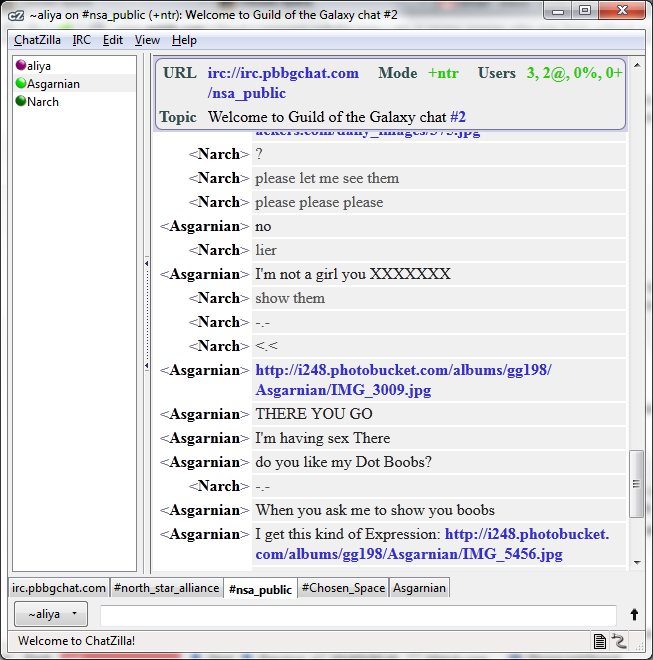 [2011-10-01 20:48:12] <Flapwazzle_Qwas> You don't like GG's name? 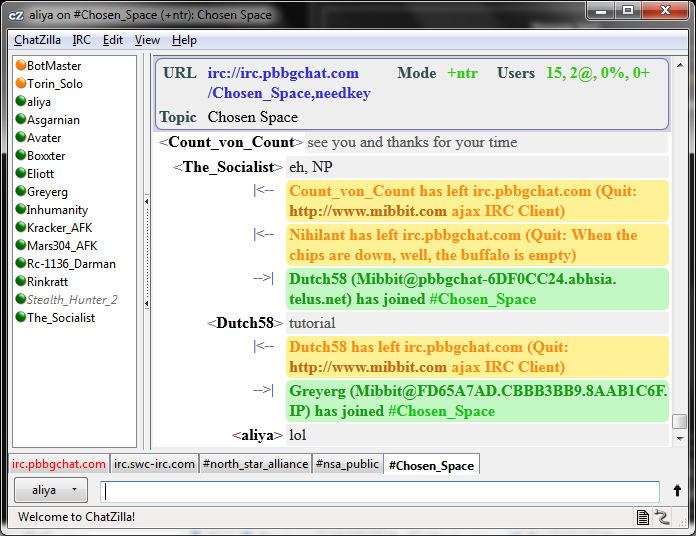 [2011-10-01 20:49:59] <Flapwazzle_Qwas> It could work Gurba! [2011-10-01 20:50:01] <aliya> what is this? 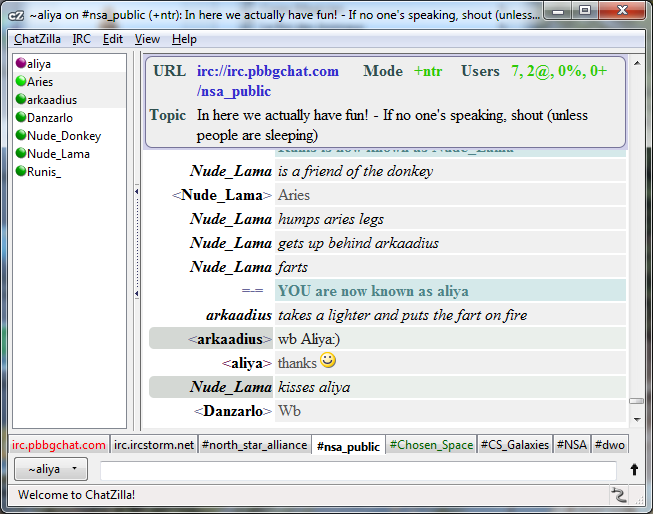 [2011-10-01 20:51:06] <aliya> an irc slap? 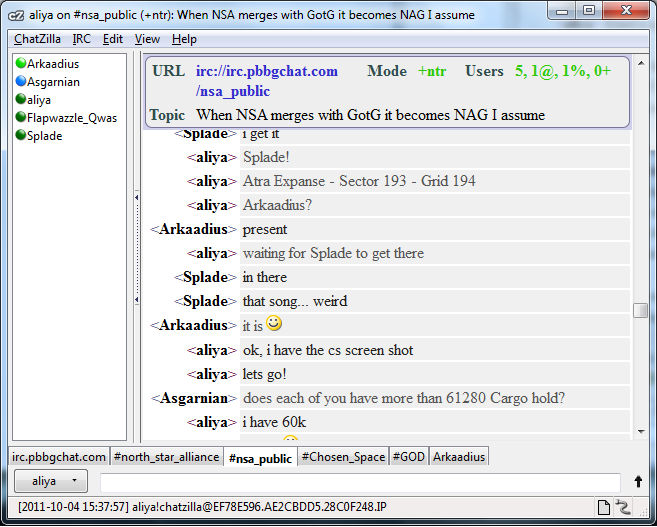 [2011-10-01 20:53:38] <Asgarnian> we can't merge..
[2011-10-01 20:53:58] <aliya> were you scared i was going to accept? 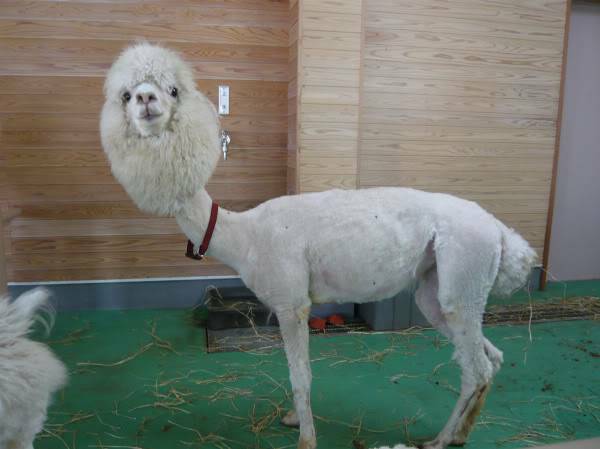 [2011-10-01 20:54:06] <aliya> you got scared! 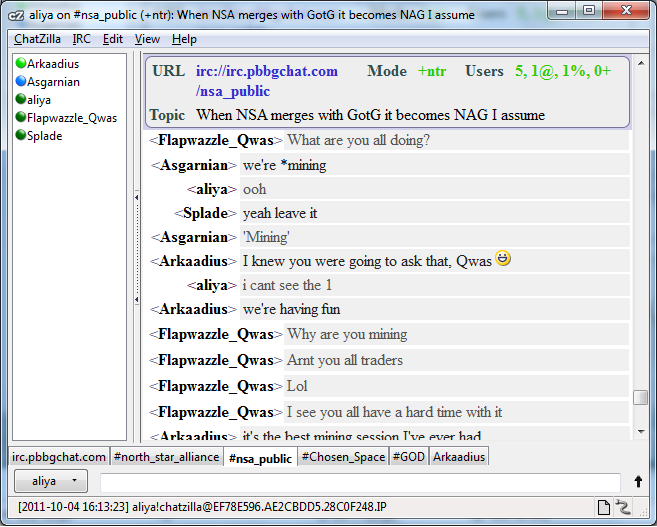 [2011-10-01 20:54:23] <Flapwazzle_Qwas> People would fear us! [2011-10-01 20:54:42] <aliya> end the joke now! 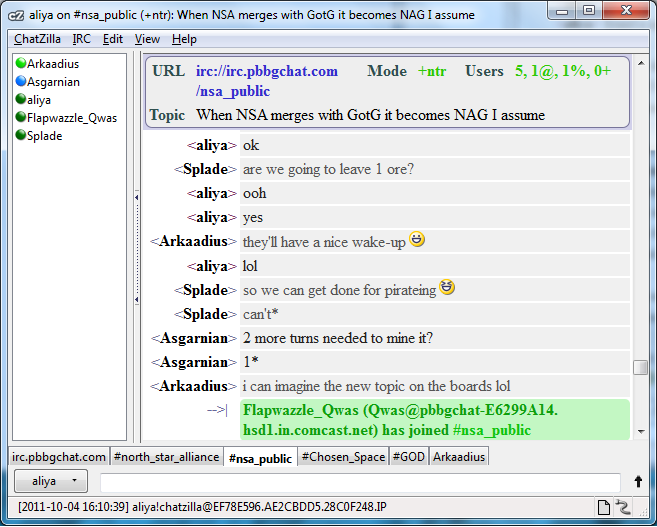 [2011-10-01 20:55:07] <Flapwazzle_Qwas> AiA have 10 pos1! 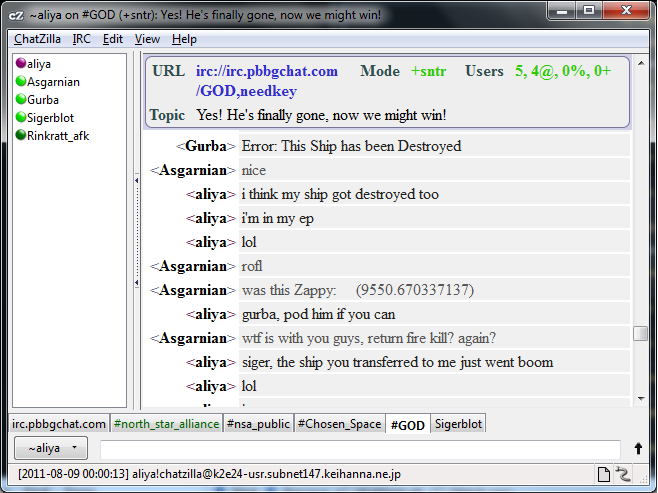 [2011-10-01 20:57:45] <Asgarnian> We're gonna get 3 planets back very soon! 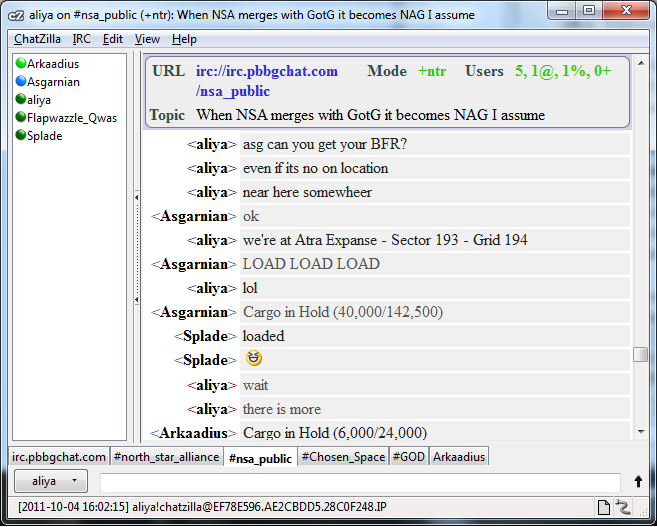 [2011-10-01 21:00:43] <aliya> did you veto merging with nsa as well? 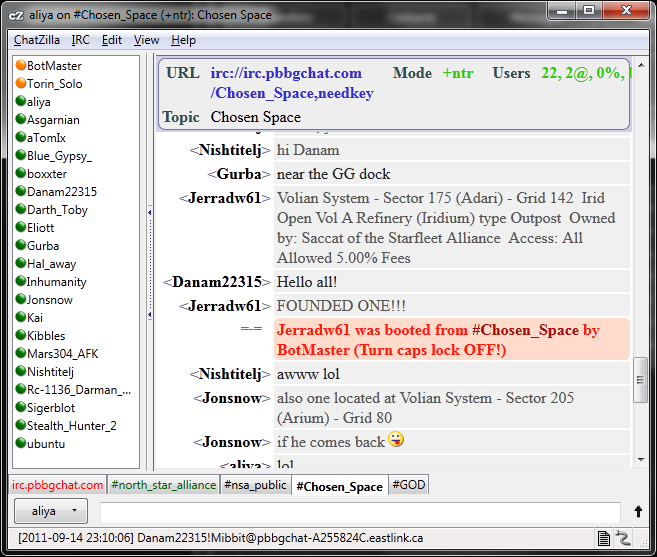 I accidentally land on CMF ships mining a quad roid! 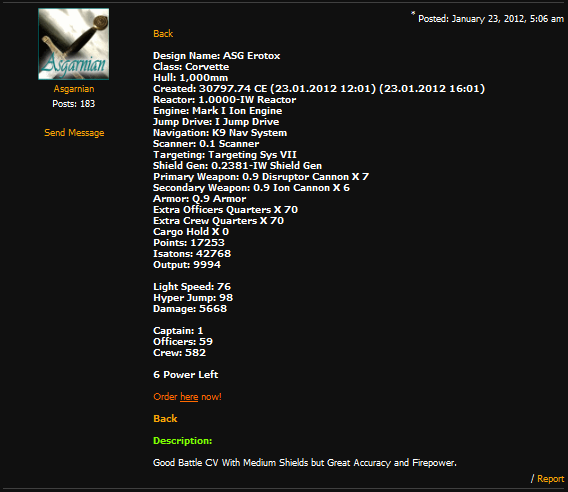 We start mining - I do not notice that we will need a lot of cargo space even though Asg mentions it, lol. 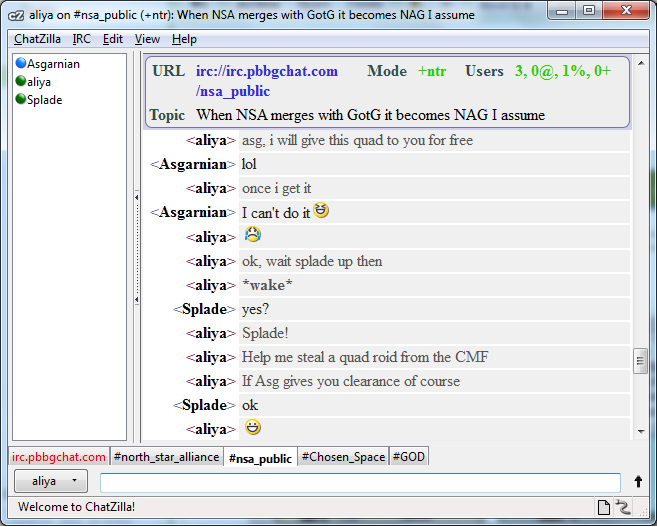 Asg agrees to come save us when I finally do notice, lol. 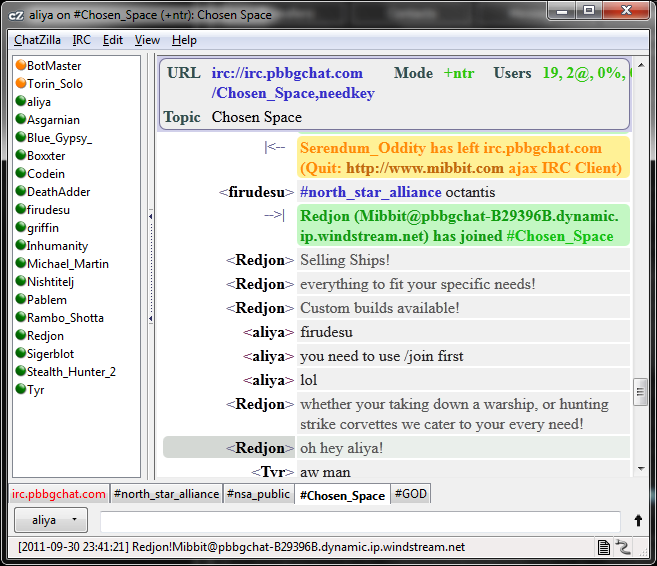 Asg is in the screenshot!!! 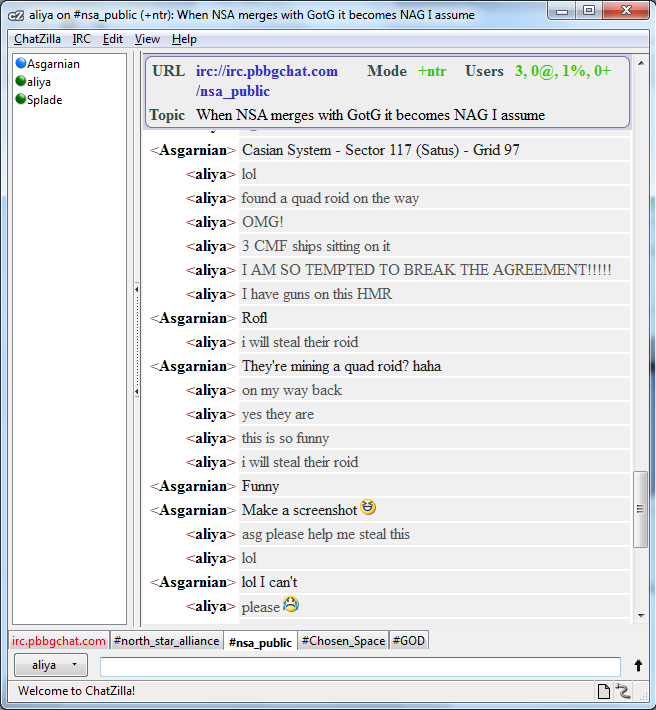 Forum spamming part II, inspired by Somers.